Moore Texas, Roger T Moore Texas History Cartoons. 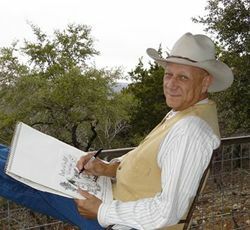 www.texascalendars.com Roger Todd Moore is a former editorial cartoonist and advertising agency owner who has been producing his illustrated Texas Calendar since 1998. Raised in the vicinity of Abilene, he owned an advertising agency for 30 years before settling in Spicewood, Texas, northwest of Austin. His "Moore Texas" cartoon appears weekly in 15 Texas Newspapers. Married with three sons and two grandchildren, he wears a cowboy hat and boots every day. Roger Todd Moore of Merkel Texas was recently the recipient of a Texas Senate commendation honoring his work as Texas History Cartoonist and as creator of the Bona Fide Real Texas Calendar which begins on March 2, Texas Independence Day. 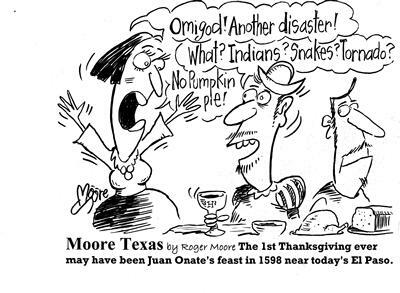 Moore has produced the calendar and MOORE TEXAS, a weekly Texas History cartoon strip, since 1998. Senator Troy Fraser says � Roger Moore is a very talented and artistic Texan. It was my pleasure to prepare a Texas Senate Resolution in his honor �. it's original, Moore or less.